Caledonian Sleeper has offered a glimpse of its brand new £150 million fleet of trains ahead of their introduction next year. A dedicated website has been launched where details of the trains will continue to be revealed ahead of their phased introduction to service from spring 2018. Visitors to the site will be able to see the development of the 75 state-of-the-art carriages, which are currently under construction. The new trains will offer a range of accommodation options including new suites, which will feature a double bed with en-suite. 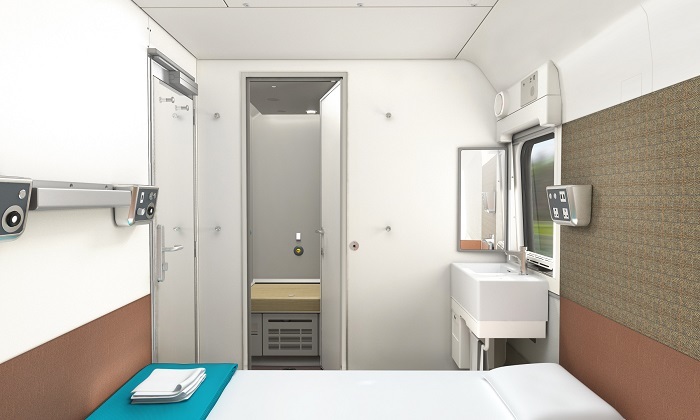 A host of new features have been included on the new trains, such as a hotel-style key card entry system, more accessible rooms, bespoke ‘comfort seats’ designed for long journeys, upgraded panels for phone and gadget charging, and Wi-Fi throughout the train. Peter Strachan, chairman, Caledonian Sleeper, said: “Travelling with the Caledonian Sleeper is a wonderful experience and the new train fleet being introduced will offer a new standard in overnight travel. “This website is where members of the public can see the latest news on the trains and discover the exciting things we have in store. “The sleeper is already a fantastic way to travel, and the new trains will improve the service dramatically. The introduction of new trains will be the culmination of a wide range of improvements and investment in the Caledonian Sleeper since Serco took over the franchise on behalf of the Scottish government in April 2015. Further information and images of the new trains will available nearer the launch date.